Alfred De Bruyne (21 October 1930 – 4 February 1994) was a Belgian champion cyclist. 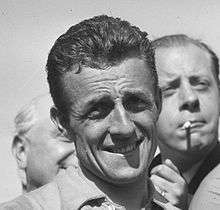 He won Milan–San Remo and Liège–Bastogne–Liège in 1956, the Tour of Flanders, Paris–Roubaix and Paris–Tours in 1957, and again Liège–Bastogne–Liège in 1958 and 1959. He also won the Challenge Desgrange-Colombo competition 3 years running (1956 to 1958). This was the fore-runner of the Super Prestige now in itself replaced by the UCI Ranking Points List. He went on to become a team manager, then a spokesman for the TI-Raleigh team, and finally TV sports commentator after his professional cycling career.